MainAll NewsForeign AffairsUK Set to Recognize 'Palestine' on Monday? 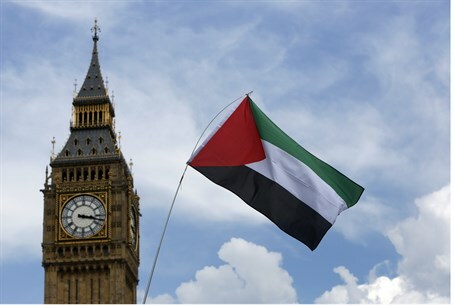 British lawmakers on Monday will take part in a non-binding vote to recognize "Palestine," after Sweden made a storm by likewise pledging its commitment to recognize a Palestinian state late last Friday on the Jewish holiday of Yom Kippur. The symbolic vote, which is being followed closely as a barometer of greater European pressure on the Jewish state, is on a motion put forward by Grahame Morris, an MP of the left-wing Labor opposition party. "If the vote is a success it would put a tremendous amount of pressure on the current government and the next government, which is likely to be a Labor government, to recognize Palestine as a state," Morris told in an email. The Labor MP added "the UK recognizing Palestine could give decisive momentum to more EU states following suit. Recognition now would be a clear and legitimate message that Britain and others recognize Palestinian rights and that the illegal settlement enterprise has no validity." In fact it has been proven in legal committees that Israel's presence in Judea and Samaria is fully legal and in accordance with international law, despite the MP's protestations. Morris touted the chances of his anti-Israel vote, saying he has the support of his party and several lawmakers from the ruling Conservative party. The sentiment against Israel was seen in the recent Gaza operation, in which the UK threatened to suspend arms exports to Israel. Dr. Jonathan Rynhold, a senior researcher at the Begin-Sadat Center for Strategic Studies, told Arutz Sheva on Tuesday that the move by Sweden and now the UK to recognize "Palestine" shows a prelude to the political war Palestinian Authority (PA) Chairman Mahmoud Abbas vowed late last month to wage on Israel. The "war" includes a request that the UN demand Israel withdraw behind the 1949 Armistice lines by 2016. As noted, the British move comes after newly-elected Swedish Prime Minister Stefan Loefven declared he would recognize "Palestine," later backtracking in the face of strong Israeli condemnation to say he would only support recognition "through peace talks." Israeli Foreign Minister Avigdor Liberman criticized the announcement, writing an article in Sweden's Dagens Nyheter Wednesday in which he charged "'progress' in the Israeli-Palestinian conflict is used, by various means, to compensate for the large number of failures and frustrations of the international community to deal with a variety of complex problems that are on the global agenda." "The words 'solution to the Israeli-Palestinian conflict' are displayed as a magic solution to most of those problems," added Liberman. It bears remembering that the move by European governments to recognize "Palestine" comes despite the fact that the PA torpedoed peace talks in April by forming a unity government with Hamas, a terror group whose military and political branches are listed on the European Union's official list of terrorist organizations.